3) MBAL "Saint Anna" Hospital – Varna, Bulgaria. A hemidiaphragmatic paresis is one of the most frequently observed complications following the supraclavicular anesthesia of the brachial plexus with interscalene approach. In patients, crucially dependant on adequate diaphragmatic function, hemidiaphragmatic paresis may provoke acute respiratory disturbances. The aim of this study was to analyze the anatomical features the brachial plexus with regard of the anesthesia of specific areas of the shoulder and the upper limb. A dissection of the cervical and the brachial plexuses was done in human cadavers. We established that in some cases the phrenic nerve and the accessory phrenic nerve arise from the superior trunk of the brachial plexus. This type of anatomical arrangement significantly increases the risk of hemidiaphragmatic paresis during supraclavicular anesthesia with interscalene approach because the anesthetic tends to invade the supraclavicular space. Key words: phrenic nerve, accessory phrenic nerve, brachial plexus, cervical plexus. Please cite this article as: Minkov M, Vankova M, Minkov R, Terzieva St, Dimitrov T, Velikov I. Complications during a supraclavicular anesthesia of the brachial plexus with interscalene approach. J of IMAB. 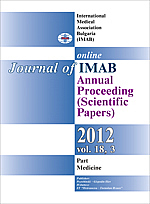 2012; 18(3):339-341. doi: 10.5272/jimab.2012183.339. 3. Williams PL, Warwick R, Dyson M, Barnister LH. Gray’s Anatomy. 37th ed. London: Churchill Livingstone, 1989: 1128-1130. 7. Albrecht H, Berle P etc. Regional anästhesie. Gustav Fisher Verlag, Stuttgart, New York, 1985: 5-47.